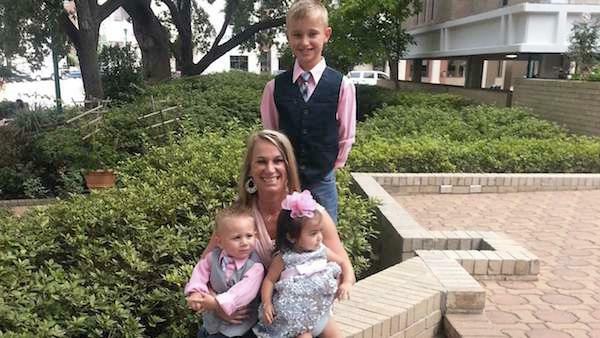 Christi Fisher is a single mom to her biological son, two adopted children and two foster kids. Watch as this super mom gets a makeover for Mother's Day to celebrate all that she does to make a happy home for kids who don't have a place to go. "There are approximately 400,000 plus children who are in the foster care system across the nation. What that means is they have been removed from their birth families for some kind of abuse, neglect, or abandonment," says Atasha Kelley-Harris from DePelchin Children's Center. "They're placed in a family, a foster family who's willing to care for these children." One of those loving foster parents is Christi Fisher. "Jaxsen was 8-months-old when he was brought to me. At 5-months-old, he and his one-year-old sister were found in an abandoned home where there was reason to believe that this was a drug manufacturing home," Christi recalls. "Bailey was born severely addicted to drugs. She had tremors. She was extremely stiff. She had the cramping, everything else as if she was an adult that was withdrawing from drugs," says Christi. "So, they had to give her morphine to help with the pain. She had to go through Methadone treatment, which is a very slow process because you can only give small amounts. She had to do a lot of therapy. The list goes on and on and on." Jaxsen and Bailey were placed with Christi as foster children. Through adoption, today they're her forever children. They are happy, healthy, and loved alongside Christi's biological son, Karsen, and she raises them all by herself as a single mom. Although it's a lot of work, Christi sees being a mom to her kids as her calling. "Being someone's hope and watching the transformation is amazing," says Christi. "The children that Christi has taken care of and has parented and adopted are absolutely blessed in that they now have the permanency they deserve to have. They now have a mom who is committed to them for the rest of their lives, just as every child deserves to have," Atasha says. "I know I may not be giving them everything that the next person might be able to give them, and I'm not going to be able to save all of them. But I saved somebody," Christi says. To show this amazing mom how much she means, The Upper Hand Salon is giving her a much-deserved makeover! Stylist Cory Jagneaux works his magic on her hair, while makeup artist Sarah Hebert gives her a new look and mini makeup lesson. Cory softens her blond highlights, while Sarah shapes her brows and teachers her how to recreate this look at home. The end result is a soft layered cut and a fresh face, and Christi loves it. "I feel amazing," she says. "I feel like a movie star." In addition to her makeover, Rebecca gave Christ a big basket of beauty products. All of the attention brought Christi to tears. "I don't think that I deserve it because I'm just a mom. I don't htink I did anything extraordinary. I don't think I did anything anyone else wouldn't do," she says. "If loving makes you extraordinary, then I guess that's what I am." For more on foster care and adoption with DePelchin Children's Center, visit DePelchin.org. For more from the stylists at the Upper Hand Salon, TheUpperHand.com.